Until some time ago, some people took time to enjoy Peruvian food in Lima, “the city of kings”; today Lima is the “Gastronomic Capital of the Americas”, and the Mecca of Peruvian cuisine; it is estimated that about 200,000 people come to Lima for food; and definitely if you are on your way to Machu Picchu in Cusco, we recommend you try and enjoy Peruvian food. The gastronomy of Perú is considered one of the best in the world; its fusion resulted from the mixture of cultures, flavors and ingredients throughout its history; dishes like the anticucho of heart (skewers of heart of res), tacu tacu and the carapulcra have African influence; pasta and variety of sauces with Peruvian ingredients have Italian influence, ceviche is the flagship dish in Peru and has great Japanese features. But Chinese and many other immigrants landed in the port of Callao, also contributed; we recommend you try the Novo-Andina food in Cusco. 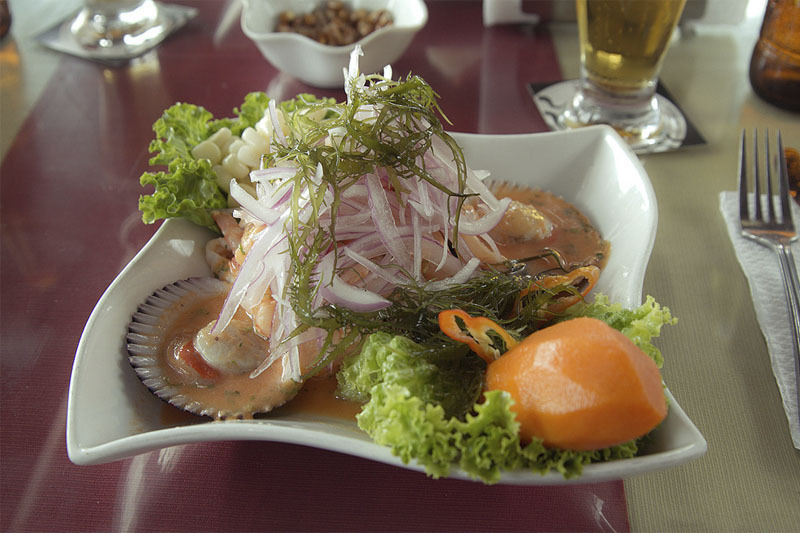 Lima is considered the secret jewel of gastronomy in the world, since it has surpassed the more traditional cuisines. According to the most important culinary magazines in Europe, seven of the fifteen best restaurants in the world are in Peru, surpassing the fabulous cuisines of countries like Italy and France. Peru is blessed with an abundant variety of natural resources in its 3 natural regions; products of the Pacific, Andean products, and spices and fish of the Amazon, that is why the horn of abundance is an emblem present in the Peruvian Shield. To give you just one example of the variety and magnitude of the ingredients available, know that Peru produces more than 3,800 varieties of potatoes, but as we told you are not only the ingredients but the incredible culinary fusion. Think twice before leaving Lima quickly, most people take time to enjoy Peruvian food, before arriving at Machu Picchu in Cusco. Unless you are an experienced gourmet, you will realize that this will be more difficult than it seems; in the menus of Creole restaurants, you will find a variety of dishes almost unimaginable, since Peru has more than 500 typical dishes. In the best restaurants in Cusco, besides Creole and gourmet food, you can find Novo-Andina food, made with Andean and organic ingredients, brought from the villages of the Sacred Valley of the Incas and the South Valley. Where to eat in Cusco? One of the best things about being in Peru is that you do not have to enter a 5 forks restaurant to enjoy delicious food, and if you do not care much about the environment, you can find delicious and cheap food in the markets, it’s something like that. as an experiential culinary experience. The typical Peruvian inventiveness mixed with a nationalistic feeling, has made many Peruvian chefs establish some of the best restaurants of Peruvian food, outside of Peru. Gastón Acurio, chef and owner of a large number of restaurants in Lima, Cusco and abroad, is known as the godfather of Peruvian gastronomy. Peruvian cuisine competes with Machu Picchu as a source of national pride . What dishes do you have to try? The fusion came from everywhere; it is known that in the decade of the 60, the Peruvian elites did not eat Peruvian food. The elegant thing was to have a French chef or an Italian. All the conjunction of facts in the history of Peru, has generated one of the most important cuisines in the world. These are some of the Peruvian dishes that you have to try to travel to Machu Picchu. Soups: It is known that there are over 2000 different soups in Peru. Peruvian sauces: made from many typical Peruvian ingredients, such as chilli or rocoto, sauces are an essential part of Peruvian food. Desserts: Peruvians love the sweet; among the desserts that you have to try, you will find the Lima sigh, the rice with milk, the purple mazamorra, the picarones, etc. Cocktails: Peru has many delicious drinks, most of them, based on Pisco (drink from Peru); try the “Pisco Sour”, the Chilcano or the Machu Picchu, all of them are made with Peruvian Pisco. Fruits: You can find apples, bananas, strawberries and other fruits in all parts of the world, but there are fruits from Peru, try aguaymanto, chirimoya or pacay. Peruvian potatoes: There is scientific evidence that potatoes have been domesticated for 10,000 years in the Andes of southeastern Peru and northwestern Bolivia. In Peru, about 3,800 varieties of potatoes are grown. Peruvian chili: In Peru there are about 300 varieties of chili (Peruvian chile) and are an essential part of Peruvian cuisine. Herbs: Spices play a key role in Peruvian cuisine, and they vary from region to region. Probably the most used herbs are cilantro, huacatay, oregano and basil, but there are many more that are essential for traditional Peruvian dishes. And a lot of herbs are used in Peruvian natural medicine; like the “Ayahuasca”.